I missed class 2. Sorry, but when your husband is out of town, your parents are our of town, your daughter's godparents are out of town and their kids can't babysit, it is simply a sign from God. I took the hint. Class 3 was very interesting though. We began by going over the prophecies. There are 5 prophecies that are used during Advent. One is used the first week of every Advent and then a different one is used each year from age 3 - 6. 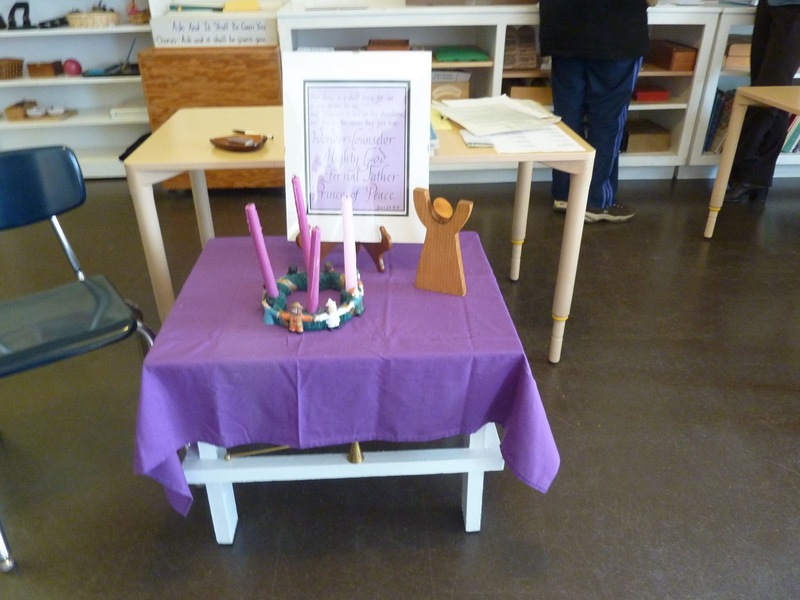 The prayer table is redecorated for Advent with a purple cloth, advent wreath, figure representing the prophet and the text of the prophesy. I have to say, I LOVE this idea. We only went over two of the prophecies, the other 3 will be in the next class, but I'm definitely planning on using at least one this year at home. The first one is the one that is used every year because of how much it impacts and resonates with the kids. It is Jesus is Light, the prophet is Isaiah and the text is Is 9:2 "The people who walked in darkness have seen a great light." The second prophecy used is the Names of Jesus, the prophet again is Isaiah and the text is Is 9:6 "For to us a child is born, to us a son is given; and the government will be upon his shoulder, and his name will be called 'Wonderful Counselor, Mighty God, Everlasting Father, Prince of Peace.'" I must say I absolutely love this idea. I love the use of the Scriptures. I love the use of the prayer table and I love the way it helps prepare and draw in the children for Advent and preparing for Christmas. 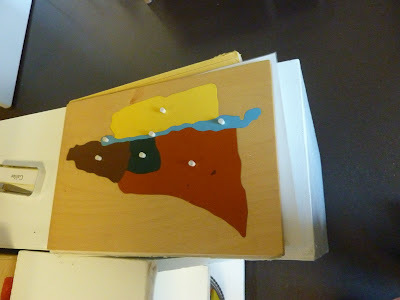 The second part of class was focused on the relief and puzzle maps of Israel. I really like the idea of these for at home as well. Elizabeth absolutely loves puzzles. I know she would take to the puzzle one especially, even if she is only 2 and the materials are designed for 3-6 year olds. 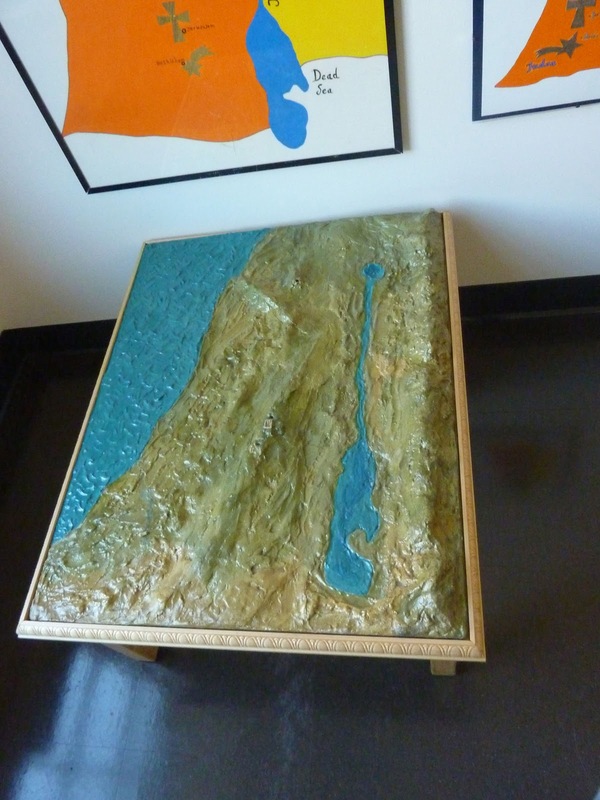 The relief map has little symbols that can be inserted at the three primary cities in Jesus' life. A dove, for the Holy Spirit, is placed in Nazareth where the Annunciation took place, a star goes in Bethlehem and a cross goes in Jerusalem. 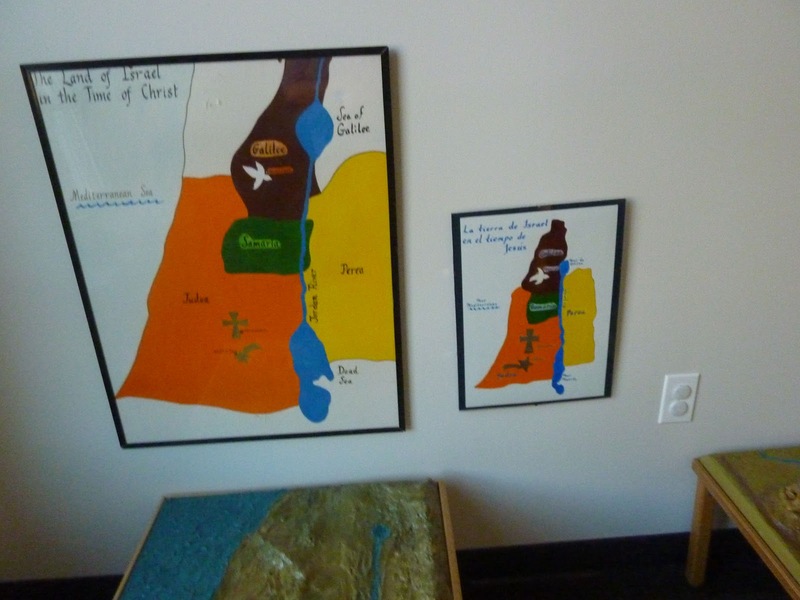 The point of the puzzle map and the relief maps is to give the child a sense of the landscape and relation of the places where Jesus lived and to help them understand Jesus as a real person in history. And, when they hear the references to the places in the Scriptures, they remember them, recognize them and can put the Scripture story they are hearing in context of the historical location. Even if you don't have or don't want to buy/make the maps, you can likewise have a traced map and let the child color the places, write the names of the areas and glue on the symbols where the cities would be. They can also learn the names of the three primary bodies of water: the Sea of Galilee, the Jordan River and the Dead Sea. The third part of our class focused on the Annunciation and the Visitation. Both of these are basically a reading of the Gospel text with a simple acting out of the text with figures. I don't have any pictures of these, but I was juggling a very mobile little girl all day. It is really a challenge and a joy to attend these classes. I completely understand why attending the class would be necessary for teaching a formal atrium. But I try to provide some information and pictures here primarily for anyone else who would like to try to provide some of these ideas at home. I'm a homeschooling mom. 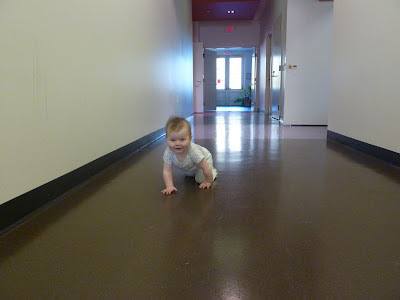 I am always looking for ways to improve our learning at home and it can be really difficult to provide that quiet, meditative environment at home, especially with smaller children, but it doesn't mean we can't try to provide some of the benefits of the Good Shepherd program at home.